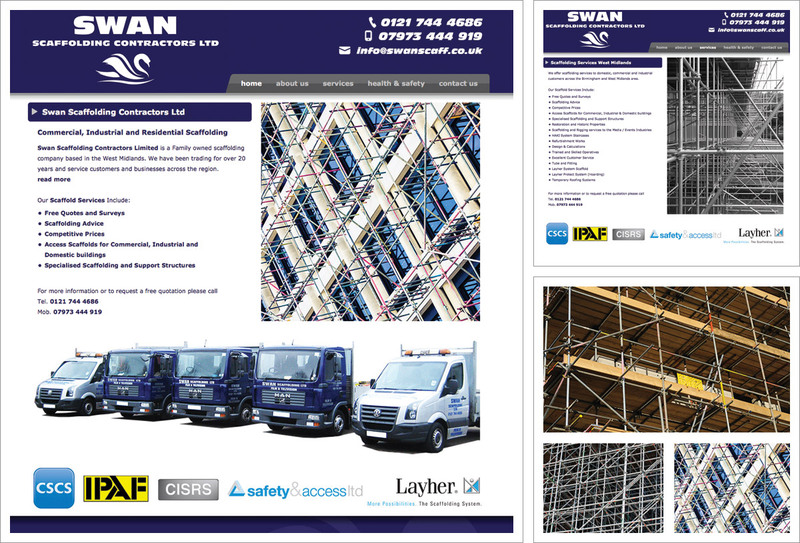 A small, yet completely expandable website for family owned Swan Scaffolding Contractors Ltd. Based in Solihull, Swan Scaffolding have a wealth of experience in the scaffolding business and their traditional tube and fitting stock along with Layher system scaffolding provides the flexibility to meet any scaffolding need. Horizontal menu offering simple,intuitive navigation. Basic on-page optimisation, observing best practice SEO and optimised for the local area. The new website lays out the services provided by Swan Scaffolding, their experience, health and safety credentials and their commitment to deliver safe systems of work by employing only fully qualified CISRS scaffolders to erect and dismantle scaffolding. A secure online contact form and full contact details are available on the Contact Us page with key contact information in the website banner on each and every page. Though Swan Scaffolding were an existing and established business they worked with us to form a new company logo around their existing branding they could use on their website and other materials.